My love for pottery started as a young girl, watching my grandmother create birds, their delicate nests, and other small creatures from clay. Her mother, a Native American of the Shawnee Cherokee Nation, taught her a love for art and nature, and in turn, she instilled in me a love for many forms of art, including music, sculpting, carving, and pottery. I also learned to play the violin, harmonica, and later, the banjo, guitar and concertina. 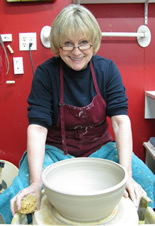 After receiving an art degree, I became an established sculptor and potter in southern California displaying and selling my wares. In the early eighties I discovered a talent for interior design, became certified, and started my next career. This career developed a greater understanding of form, scale, texture and color, which proved to be of value in later clay work. By the early nineties I spent time enjoying, music, singing, interior design, sculpting, floral design, and wood carving. After a long absence from throwing, my favorite form of art was rekindled: working with clay. Soon there was a demand for my pieces and I began clay-making full time, thus, Claymakin’s studio was opened. Inspiration comes in all forms, for me it is my love for nature, friends, and also a well developed imagination. Much of my work is focused on creating functional pieces, such as dinnerware, casserole bakers, and platters, but, I truly enjoy creating custom orders, indoor and outdoor decor, and pieces of whimsy as well. Sculpting whimsical faces on mugs, bowls, leaves, bird houses, and making frogs and little creatures, keeps the levity flowing, gives me great pleasure, and brings about smiles and shared laughter. 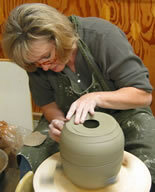 All of my pottery is hand thrown or hand built, and individually glazed, making each piece a one-of-a-kind. Because each creation is handmade, there will be slight differences even between similar works. 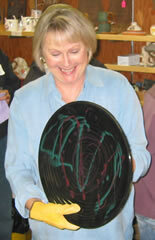 Claymakin’s studio produces stoneware pottery that is lead free, oven, microwave, and dishwasher safe. The garden art has withstood outdoor temperatures as low as 20 degrees. I hope you enjoy my pottery as much as I enjoy making it!